- 16 channel active summing network and stereo bus with fully balanced stereo insert path. - Transformer balanced analog outputs. Transformer control for "tight" vs. "warm" mix bus sonics. - Precision Detented Master Bus Level Pot with Stereo Bus Calibration Trimmers. - Original Electrodyne design transformers and discrete transistor op-amps throughout. - Stereo Mix, Artist Cue, XLR and 1/8" Mobile Device Inputs. - Precision Detented Control Room Level Pot. - Mono, Dim and Mute Controls. - Main/Alt Monitor Selector with Precision Level Trimmers for Alternate Speakers. - Extremely Low Distortion Balanced Signal Path for Quality and Accuracy of Monitoring. - High Power, Low Distortion Headphone Amplifier. - Cue Input Talkback Loop for Artist Headphone / Studio Monitor Mix. - Integrated Talkback Microphone with Control Room Monitor Dim function and Remote Talkback Jack. (eq: Kick, Snare, Lead Vocal, Bass, etc…) Avoids using up a stereo pair for mono tracks. 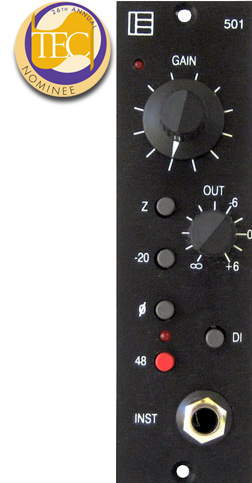 2) MIX level knob: 31-step detented Master Stereo bus level for accurate recall. “0” setting is unity gain. +6db of gain above unity is available for boosting mix levels. 3) INSERT button: Engages a fully balanced Stereo bus insert for mix mastering and stereo processing gear. 5.) -TRANSFORMER button:Changes mix bus tones by switching mix amps and output transformers to two different configurations. “WARM”, classic 1970’s full transformer harmonics. “TIGHT”, smooth and silky with controlled harmonics. 6) TALKBACK button: Mutes incoming CUE or CR LISTEN audio and sends Talkback Mic to CUE bus outputs. 7) TALKBACK level knob: Adjusts level of Talkback microphone to CUE bus outputs. 9) CR LISTEN button: Switches CUE output from CUE input, to audio selected on CONTROL ROOM source selector buttons. 10) CR LISTEN level knob: Adjusts level of audio from CONTROL ROOM source selector to CUE outputs, when CR LISTEN is engaged. 11) EXT-1 button: Selects Control Room input from 1/8” front panel jack. 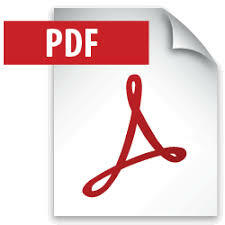 For SmartPhone, MP3 player and other portable audio devices. 13) EXT-2 button: Selects Control Room input from rear panel balanced XLR connectors. 14) CUE button: Selects Control Room input from CUE input xlr's. 15) MIX button: Selects Control Room input from Summing section Stereo mix bus. 16) CONTROL ROOM knob: Controls level of studio monitor speakers. 18) DIM button: Reduces CONTROL ROOM level by approximately 20db. 19) MUTE button: Mutes studio monitors. 20) MONITORS button: Selects MAIN or ALT monitor speaker sets. 21) ALT trimpots: Adjusts level of ALT speakers for matching MAIN speaker levels. Main, and turning down ALT trimpots to match MAIN speaker levels. 23) HEADPHONE jack: 1/4” TRS jack for professional headphones. WARNING !!! HEADPHONE AMP HAS SIMILAR POWER TO PROFESSIONAL STUDIO CUE SYSTEMS AND CAN GENERATE EXTREMELY HIGH LEVELS ! 24.) -AC INLET: AC 110 or 240vac. selectable. (shield) Not connected, (see pinouts page). 30) 1-8 input: DAW input connection. (+4db nominal level) db-25 Tascam standard Analog Input wiring, (see pinouts page). 31) 9-16 input: DAW input connection. (+4db nominal level) db-25 Tascam standard Analog Inputwiring, (see pinouts page). 33) MONITORS / METER / MIX MULT: db-25 MAIN and ALT Studio monitor speaker outputs, Stereo METER buffer amp outputs, Stereo MIX bus outputs. db-25 Tascam standard Analog Output wiring, (see pinouts page). Output levels optimized for active (self-powered) speaker systems. exceeding input levels of standard digital converters, not for typical operating levels. Operating the Summing Station within normal studio levels will provide superior performance and sound. 2.) Refer to pinouts page for input / output connector types, connector pinouts and accessory wiring notes. material, and “TRANSFORMER” setting on SUM section. Summing Station discrete transistor summing opamps, mix bus opamps and output transformers. The Electrodyne 2511 is a classic two-band discrete transistor reciprocal active inductor equalizer using 1969 / 1970 design technology. The custom inductors and output transformer are made by Electrodyne’s original maker, to strict factory manufacturing tolerances as small as 2%. This allows consistent eq performance and repeatability from channel to channel that was not possible in the 60,s. Smooth performance and eq response from minimum to maximum gain at all frequencies, provides unusually broad sonic and tonal options not experienced since the 1970,s. 4 frequencies selectable per band. LF: 40, 100, 250, 500hz. HF: 1.5k, 3k, 5k, 10k. 4 frequencies selectable per band. LF: 40, 100, 250, 500hz. HF: 1.5k, 3k, 5k,10k. The Electrodyne 501 is a two stage discrete transistor, transformer coupled preamp with active DI, using classic 1969 / 1970 design technology. 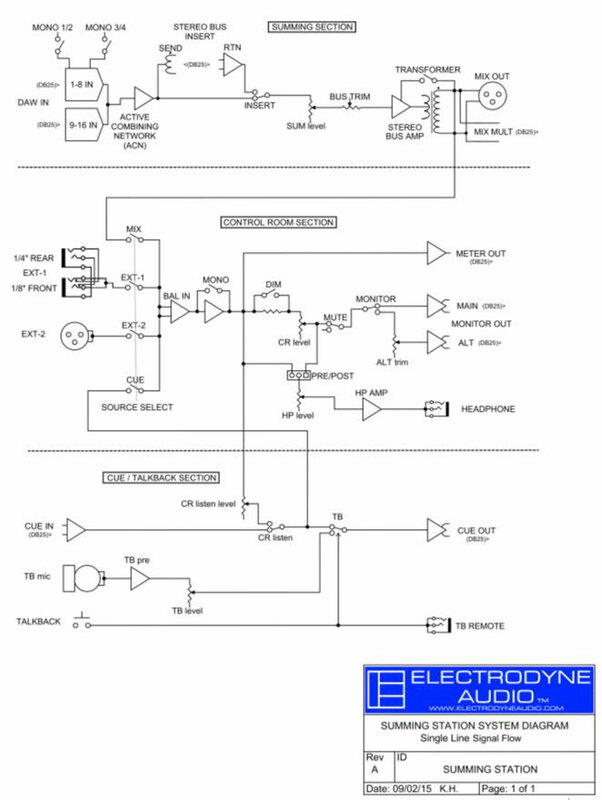 Each amp stage is individually optimized for peak performance using Electrodyne factory engineering notes and selected high performance components identical to the originals. The transformers are made by Electrodyne’s original manufacturer to exacting factory specifications. The active DI circuit presents an almost immeasurable load to sensitive musical instrument outputs allowing incredibly accurate capture of the instruments true tone. The output of the DI circuit is designed to directly connect and interact with the mic input transformer to allow maximum tone options.